There appears to be serious thought going into how to turn NUFC’s fortunes around this season and with any bad situation you find yourself in, the first thing you need to do is examine where you are going wrong. “The bottom line is that as a football team you have problems and you have to acknowledge them, otherwise you will not solve them. We’ve looked at all the problems we have, including set-pieces, and we are going to have to change and work with a different team. A big creative force of this team is in the treatment room, Hatem Ben Arfa and Yohan Cabaye are two big players for us in terms of imagination. You cannot suddenly say to a team, start and deliver the type of imagination they give us. So we have to come up with a different game plan to win games”. The problems with set-pieces are long running and with no goal from a corner in the Premier League since October last year, coupled with the fact that Newcastle are the only Premeir League club who haven’t scored from a set-piece this season, says it all. 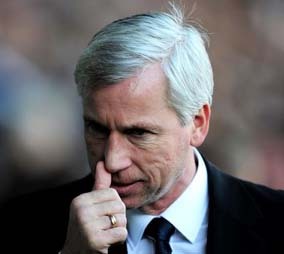 In the summer Alan Pardew said that he intended bringing somebody in to specifically work on set-pieces but nothing was heard since then, likely yet another cost cuttiing measure alongside those that stopped the recruitment of the extra players Pardew was desperate to add to his squad. While the options don’t look great in terms of the personnel available at the moment, it is likely that Alan Pardew will have to come up with a very different strategy to take into the match with Stoke if we are to get anything at all from it, while against Wigan on Monday he’ll have to put his thinking cap back on.